When I say slow, it used to be international slow, which I can understand but now it's local slow. Latency wise it's fine, I still ping orcon at a very good 11~14ms ping. But throughput is incredibly choked. 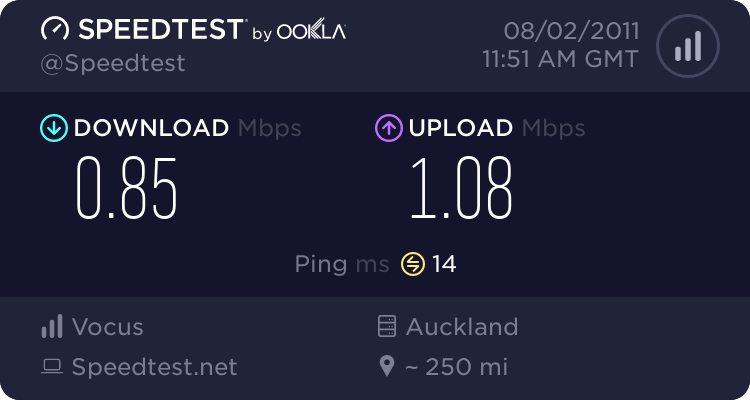 Due to cabinetisation I sync at 18~20Mbps, and usually when I do a speed test or downloading from NZ I can get up to 1MB/s easily. But now, I'm getting about 1Mbps to vodafone or to WxC.. what is going on? Sync rate is good but something else is up, Can you post your modem stats? alliao: When I say slow, it used to be international slow, which I can understand but now it's local slow. Good idea johnr, guess I've been getting better responses here from Orcon than their official support channel, but I will do so now. 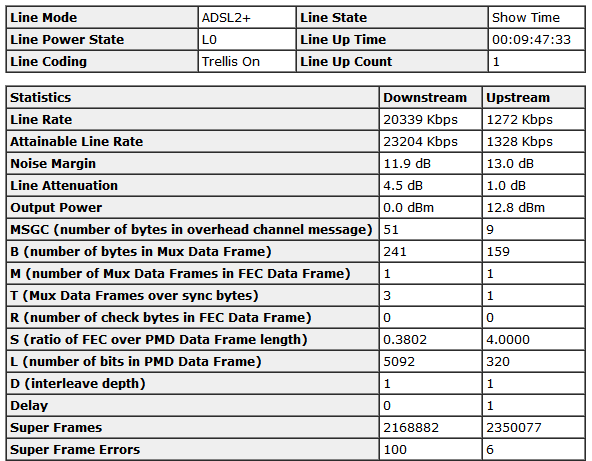 Here's my modem stats. I was switched more than a year ago I believe, hence my sync rate is extraordinary good. ps. just logged the fault, I am those that likes to type my own url, and I came across an old relic! behold orcon support page! Thank you for your email regarding your Orcon broadband connection. From your email I understand that you are getting slow speed for your internet connection. I have now completed a full reset on your account and services in the hope of resolving this issue. Please reboot modem after 15 minutes of receiving this email and see if this issue has been resolved. If problem persist, please perform some physical troubleshooting to establish what is causing this fault. Please perform an isolation test. This requires disconnecting all telephony devices in your home (including Sky TV decoders and filters). I also advise connecting your modem directly to a jack point (excluding filter) and to also try a different jack point. Please also test your connection by using an ethernet cable (if you are currently connecting via wireless) to make sure this fault is not related to the wireless connection and try a different modem (if you have a spare one) or to test the modem at a different property as the issue you are describing could very well be related to one modem. If the isolation test does not improve your internet connection, please do give me a call on the number below and I'd be happy to book a technician for you. Standard troubleshooting steps to try and isolate the problem before sending a tech out. Wonder what could be the issue? 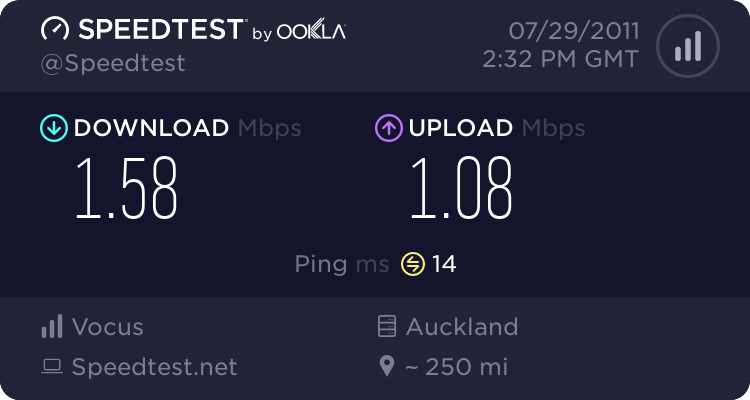 I'm syncing at perfect rate, and still getting this less than 1Mbps nationally traffic, everything lags, including gmail. Quite bizarre really. So anything US based is not far from dialup speed! Pretty much leaves a large chunk of the net unusable. Don't know if I am on a cabinet or exchange - next door to Rangitoto Collage, but I do know Orcon does not own the equipment that I am connected to. Modem Synch is at 18/1 so is all normal - during the day everything is fine. Slow and disconnects, probally had nearly 20 today - yet ring them up and "Oh we only have 1 recorded here" BS that they give you.